If you own a home in Chandler, you are going to need to have a professional handyman service in Chandler as your number one home improvement contact. That’s where Built by Grace comes in. 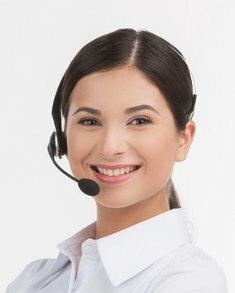 There are several reasons to call us. Why? Well, we can do a lot of things that are beyond most services like ours. First off we are experienced with both home repair as well as home remodeling. What this means for you is trust. You can trust us to make sure that your project is completed with high levels of craftsmanship, professionalism, as well as punctuality. You have a home in Chandler, and if you own a home, you know that repairs and renovations are part of owning a home. 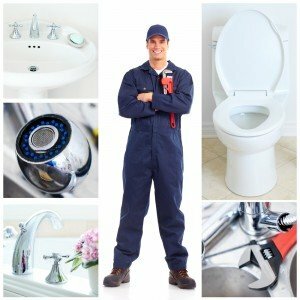 We are a professional handyman service in Chandler, AZ, Electrical, paint, drywall, plumbing, installation, and repair are all areas that we can help you with. Not to mention some building projects and other areas that may surprise you. Let’s look at electrical repairs and upgrades first. What sort of electrical repairs and upgrades can Built by Grace help you with? Ceiling fans are a good example. 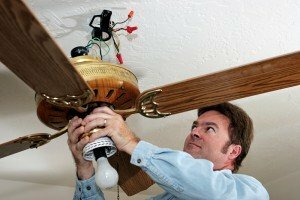 Trying to put in a ceiling fan on your own can lead to potential injury or damage. Ceiling fans weigh 50 lbs or more, and often require more than one person to install a ceiling fan. Built By Grace’s professional handyman service can safely remove an old ceiling fan and install a new one. But it’s not just ceiling fans that we can help you with. How about putting in a new light fixture? Or maybe you need to fix something. In addition to electrical installations, there are also simple electrical fixes that our handyman can do such as replacing an outlet, adding dimmer switches, replacing/installing light fixtures, and any other electrical home repair tasks. Another area that may surprise you is that we can also help with plumbing issues. But what about your drywall and your paint? Sheetrock is taken for granted but it serves a lot of purposes from fire protection to soundproofing. It makes up most of the inner walls and ceilings of your home. Built by Grace’s handyman in Mesa can replace your drywall if you need it, or make even small drywall repairs and patches. 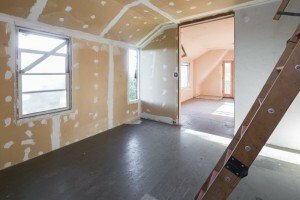 In cases where there may be any sort of water or mold damage, replacing drywall is a good idea for health reasons as well as to improve the way your home looks. And once drywall is installed then obviously you’ll want to texture and paint it too. Remember, that when you are looking for someone to help you with home improvements as well as repairs you will want to keep as many things as you can with one service. There are so many benefits to working with Built by Grace…not the least of which is the fact that we’re a licensed general contractor and experienced in all phases of construction. Contact us today.